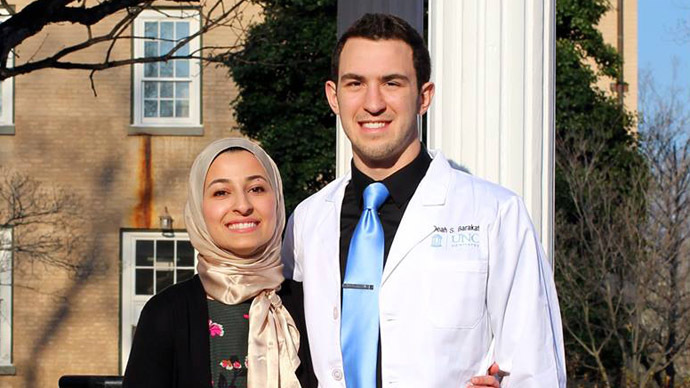 Three members of a Muslim family in North Carolina’s university town of Chapel Hill were gunned down in their home. What some are alleging was a hate crime has sparked grief and anger in the US and beyond. The victims in the triple homicide have been identified as Deah Shaddy Barakat, 23, his wife, Yusor Mohammad Abu-Salha, 21, and her sister, Razan Mohammad Abu-Salha, 19. Police responded to a call about gunshots in the family’s apartment complex at 5:11 pm Tuesday. They discovered the bodies of the victims, all of whom were pronounced dead at the scene. Several neighbors told The Daily Tar Heel student daily that that had not even been aware of the shooting. Kristen Boling, a student at University of North Carolina at Chapel Hill who lives in the complex, told the paper she arrived home at 3:45 pm but didn’t hear or see anything until after police arrived. I hope the @FBI is working closely with #chapelhill PD on this horrific shooting. Community wants answers. A 46-year-old man identified by police as Craig Stephen Hicks turned himself in late Tuesday night. He was subsequently arrested on suspicion of three counts of first degree murder. Police say the killings might have been committed over a parking space dispute. “It appears to have been part of an ongoing dispute over parking," Lt. Joshua Mecimore, a spokesman for the Chapel Hill Police Department, said to LA Times. The incident has provoked massive speculation on social media that it was a hate crime, with many posts carrying the hashtag: #MuslimLivesMatter. The father of the two sisters, Dr. Mohammad Abu-Salha, said the murders were based on the victims’ religion and culture. “It was execution style, a bullet in every head,” Abu-Salha said, as quoted by the News & Observer. Hicks is a self-described atheist who regularly posted content critical of religion on his Facebook account. According to US media, Hicks allegedly wrote in one post: "When it comes to insults, your religion started this, not me. If your religion kept its big mouth shut, so would I." The quote in question was paraphrased from Pat Condell, an Irish comedian and atheist internet personality. A Twitter account that likely belonged to Deah Barakat shows a post published a week ago that expressed his concern over increasing cases of religious and national hatred over recent months. The shooting has elicited a strong response on social media. Chris Rock, one of the United States most popular stand-up comics, retweeted a photograph of the victims providing food and dental supplies to the homeless. Rock, along with other social media users, has accused the mainstream media of ignoring the shooting. The #ChapelHillShooting would be #BreakingNews if the killer identified himself with Islam. Media forgets that the 3 killed were Americans. Others have focused on the victims themselves, their love of life and dedication to their community. According to the regional daily The News & Observer, Yusor was scheduled to graduate in December with a degree in biological sciences from NCSU, according to a university statement. Barakat, a Syrian-American, studied business administration and management at NCSU before enrolling at UNC-Chapel Hill in 2013 to pursue his doctorate in dental surgery. Razan was studying architecture and environmental design at NCSU. Deah and Yusor were married on December 27, and appeared to be vibrant and active members of their community. Barakat was planning to travel with 10 other dentists this summer to Reyhanli, Turkey, where they planned to treat Syrian refugee students for urgent dental work and distribute toothbrushes and toothpaste. He had organized a fundraising campaign for the trip, which has so far collected over $25,000 for the cause.